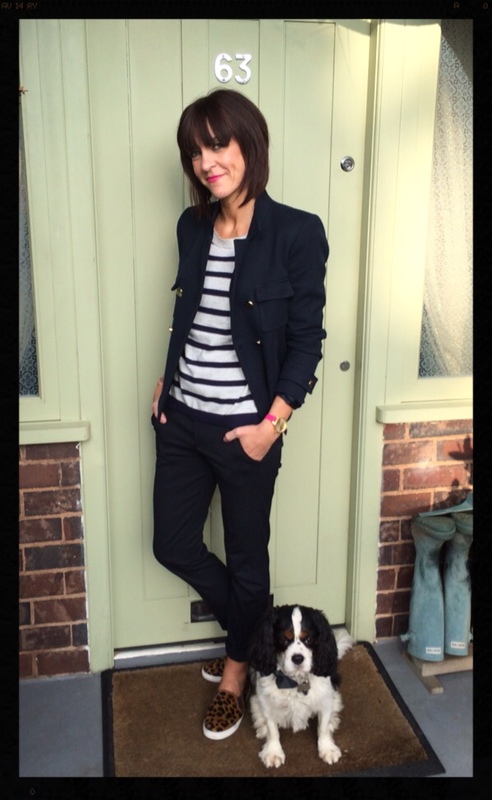 Following on from my recent post on my picks from Boden's latest launch (see here) I thought today I'd do a little show & tell with some classic pieces that the lovely people at Boden kindly sent me. As I've previously said for the past 18 months or so, in my eye Boden have really upped their game & have started stocking some real wardrobe classics that don't necessarily scream Boden but have a real elegance & style that can be dressed up or down & are simply going to last a lifetime. The more I think about dressing the more I realise that less really is more & you really can't go wrong with well styled, classic pieces accessorised with some statement accessories. So with this in mind here's what I picked. 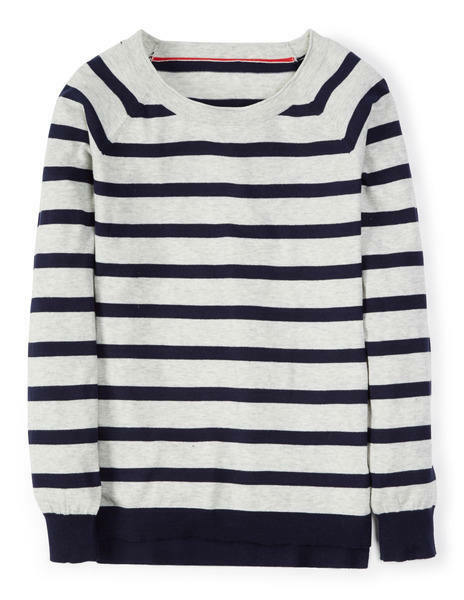 First up it's another breton top BUT this one has a dipped back!!! 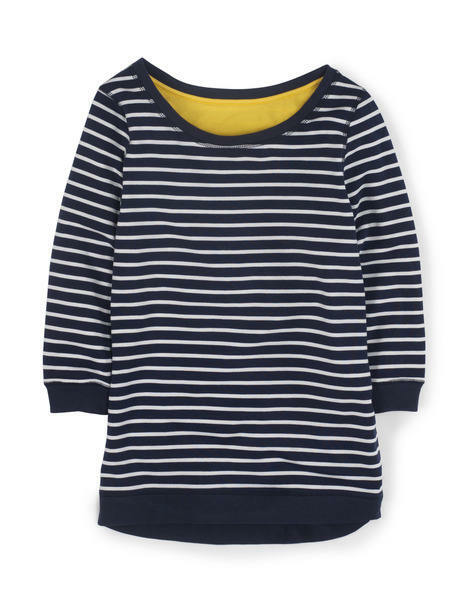 I love the casualness of this top as it has a real sweatshirt feel to it but because of the dipped hem feels that bit more stylish so it's going to be ideal for dressing down but of course can so easily be dressed up to. 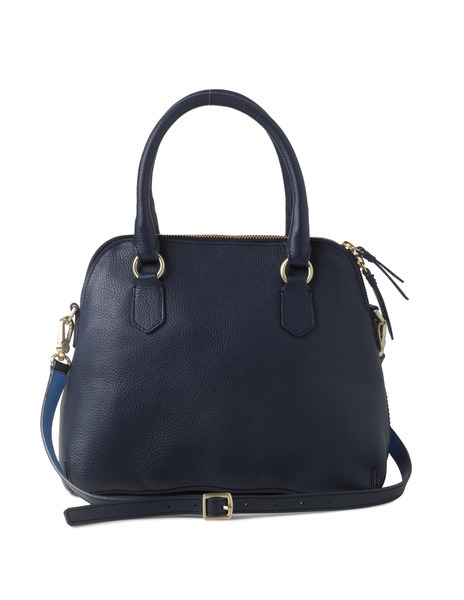 Keeping the words classic & stylish in mind, I'm sure you'll agree this stunning navy bag is a style that's never going to date. It has a good amount of internal pockets, which are essential if like me you are forever trying to find your keys, lippy & mobile plus a textured leather on the outer meaning it's not too easy to scratch, as well as a detachable strap. 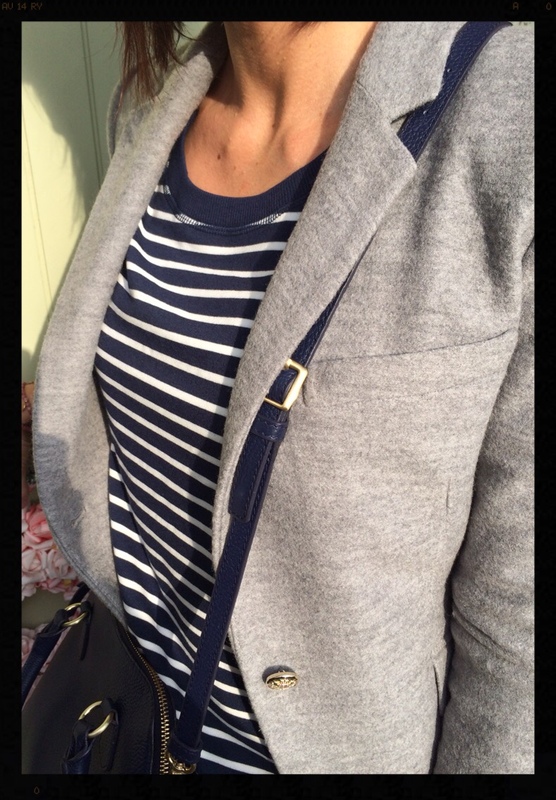 Now we all know I love a stripe & in my mind a wardrobe can never contain too many & this beauty is in a slightly different but yet still classic colour way. I just love the delicate grey teamed with the navy & being a lovely lightweight knit it's going to be perfect for wearing this Spring & Summertime. 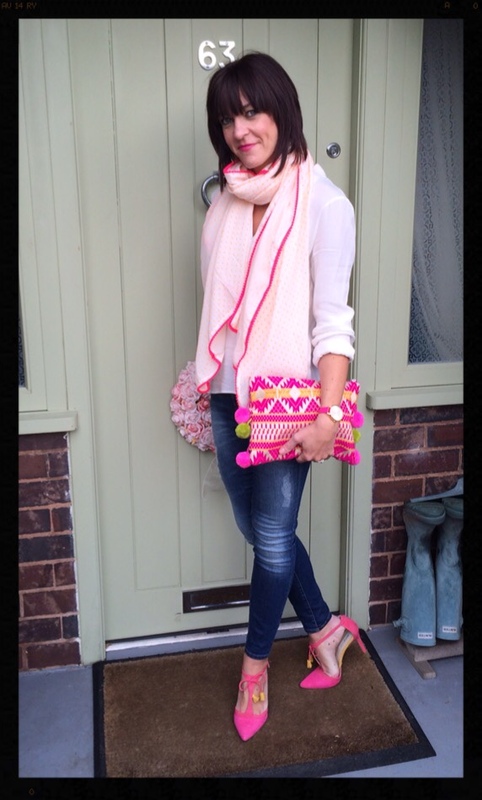 As I mentioned above invest in classic, stylish plain pieces & you can afford to play around with accessories & of course this scarf with it's pom pom edging not to mention the fact it's neon pink really needs no explaining as to why I picked it does it?! 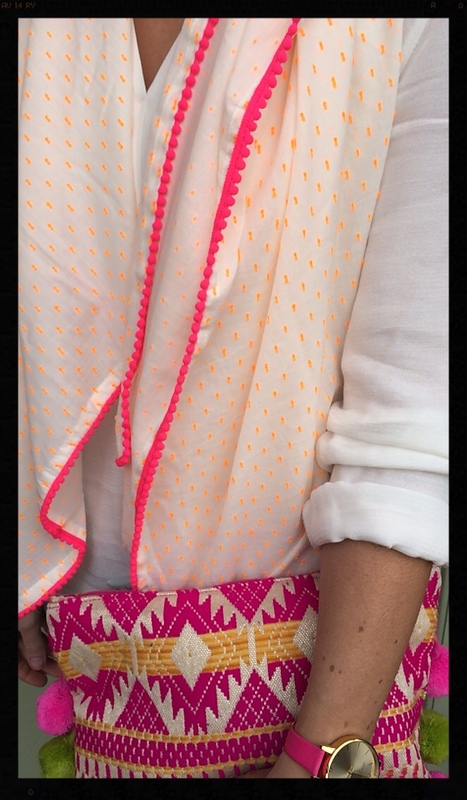 But it's going to be perfect for injecting a splash of colour to an outfit but not in an overpowering way. Come spring & even more so in the summer I just love wearing dresses so as soon as I spotted this lightweight denim dress at their press day I just knew this would be a perfect addition to my wardrobe. Perfect for throwing on & layering up with some statement jewellery - what's not to love?!! 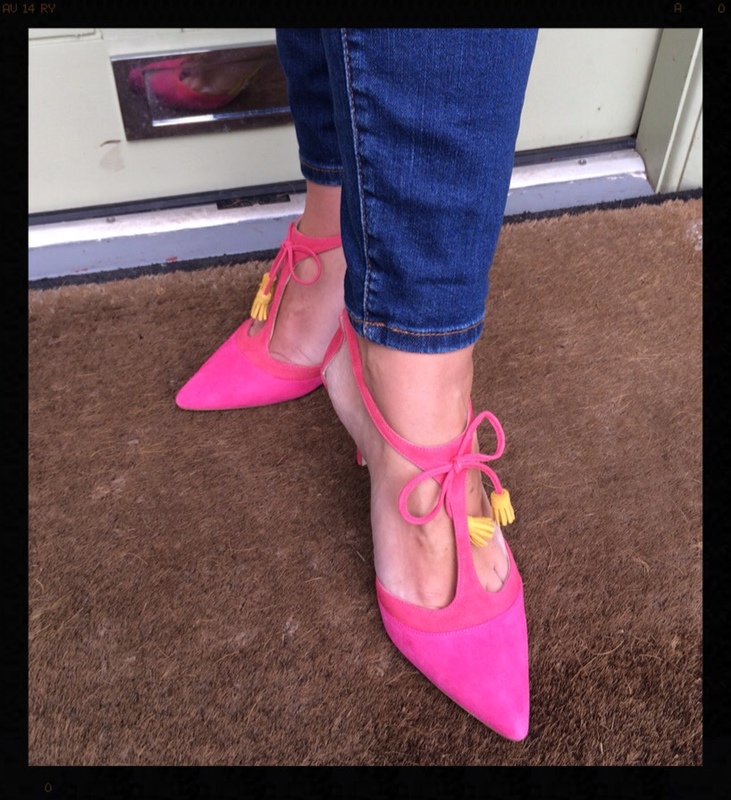 And of course what better way to inject a bit of individuality to an outfit than with some statement heels & these beauties are even more stunning in the flesh. I've gone for the higher heel version (8.5cm) but they're also available in a mid-heel (6cm) (click here). Available in several stunning colours I was really torn between the amethyst & navy version but in the end I just had to pick the tutti frutti & raspberry version. So how would I style these beauties? Well being great neutral classics they're of course going to go with lots of things & can be worn many ways but thinking of sunnier times here's my initial ideas. 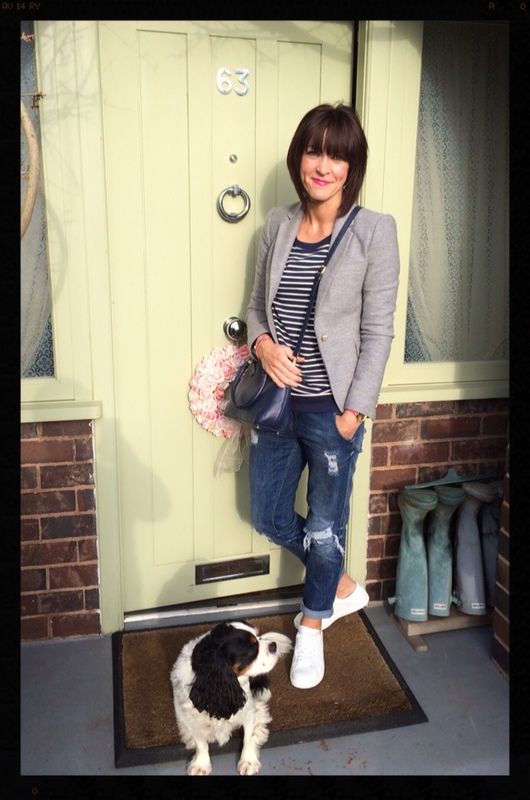 First up I just couldn't resist teaming the dipped hem sweatshirt with grey, distressed denim & one of my new additions - white trainers!! Plus of course it's the perfect outfit to team with the Westminster bag too. As you'll see from the picture the bag is a great size - as baby bear from Goldilocks & the Three Bears would say not to big & not to small! 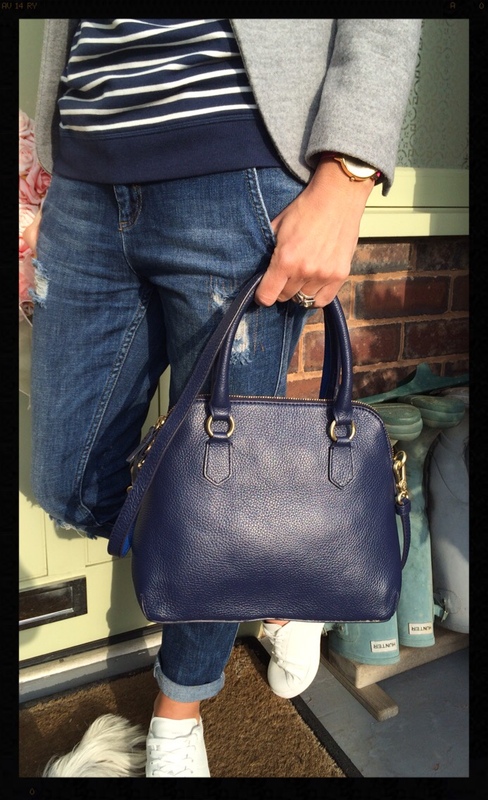 Perfect for throwing everything in & equally ideal to be worn as either a handbag or cross body. I must admit I hadn't expected to like this bag worn across the body but it's won me over, which has to be in part due to the sizing as it really is the right size to go across the body. 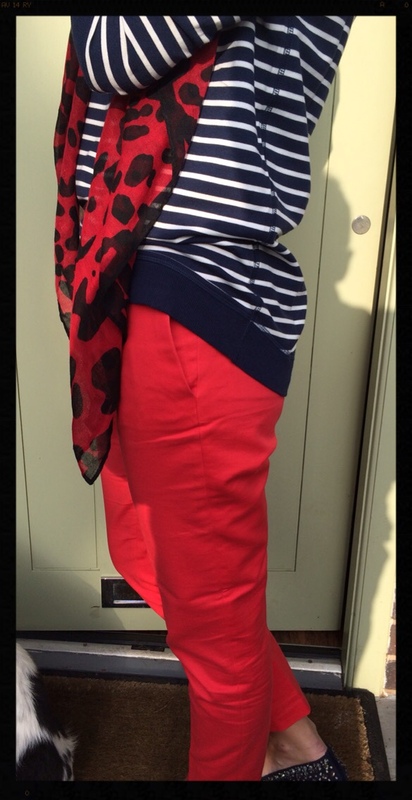 And I just couldn't resist teaming the stripes with a bit of leopard print & red not to mention my sparkly shoes. Apologises for the photo bomber I think by this stage he'd got fed up with not being the centre of attention & was trying the 'sitting bang in the middle of the photo with my back to you' tactic in the hope of gaining some fuss! Size wise I decided to size up with this top as I wanted something that was a looser fit to give a more dressed down feel plus of course there's plenty of room for layering so I can get my wear in the cooler months too. I just love the dipped hem at the back as it really does give it that bit more style, plus who doesn't love covering their bum?!! Moving onto the Easy Day Jumper & again I decided to size up for a more relaxed fit. This really is a gorgeous top that's so easy for teaming with some classics & of course I couldn't resist adding my leopard print slip ons, which incidentally are now back in stock, see here. But equally looks just as good when worn on it's own. Come the warmer months I'm planning on wearing it with some simple sandals, a couple of delicate necklaces & a stack of bracelets. It really is a great go to dress for a laid back summer look. And I just love the button detailing on the neck & sleeves. I went for my normal size in shoes & they fit brilliantly & surprisingly are pretty comfy even on the first wear. Plus for anyone like me that suffers with heels slipping out of high heels the adjustable strap is brilliant & means there's no worries of having a Cinderella moment, although of course any Prince's out there please feel free to approach ;-) (hubby I'm only joking....pinky promise!). Stepping away from all things striped & finishing with what I'm wearing today - keeping it simple with my Zara shift dress, oversized scarf & biker boots. So what do you think, do you think I chose wisely & these new beauties are going to be hard working additions to my wardrobe? 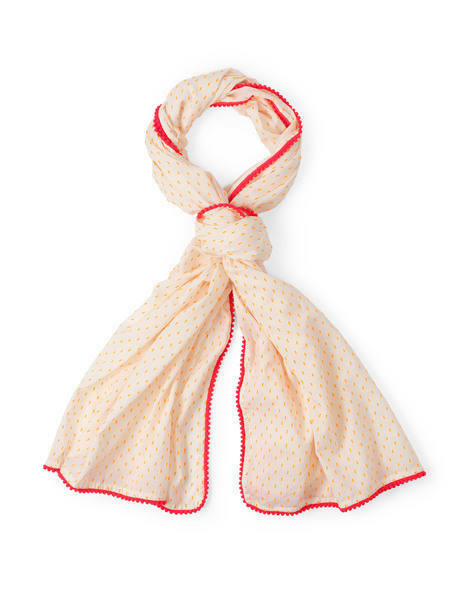 How about you do you see anything to tempt you or have you got your eye on some of Boden's other stunning goodies? I'd love to hear your thoughts on Boden's latest offerings & what's tempting you. Enjoy your Sunday & make the most of the last day of half term. I'm guessing that tomorrow morning is going to be interesting getting everyone up & out on time & back to school! I know I'm incredibly lucky aren't I Annmarie & I couldn't believe my luck with the shoes matching so well with my pompom bag. They really are stunning & even nicer in the flesh! You should definitely give the skater shoes a whirl I was so convinced skaters weren't for me but these beauties changed my mind instantly I just LOVE them! Aww thanks Rachel & yes roll on Spring - oh to feel the warmth of the sun again - surely it's only a matter of weeks away?!!! Ooh what have you purchased Lotty? They have a really strong collection for SS15 don't they far too many lovely & stunning temptations & the colours in the scarf are just stunning, I can't wait to wear it. 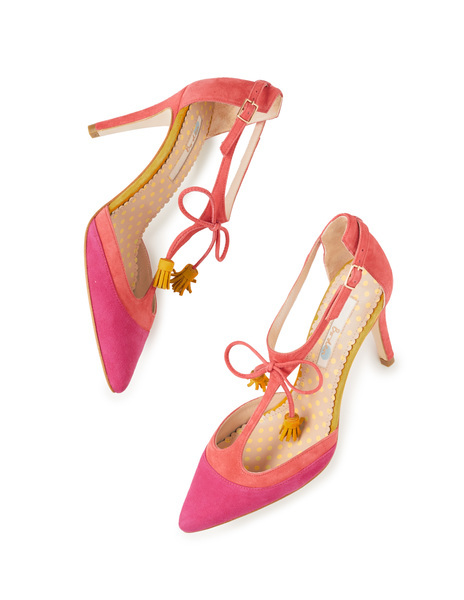 Yes the Alice shoes are definitely this season's version of the sparkly flats! I just love the Easy Day jumper Sian, it's a lovely light knit which will be perfect for the warmer months - what colour way have you ordered? 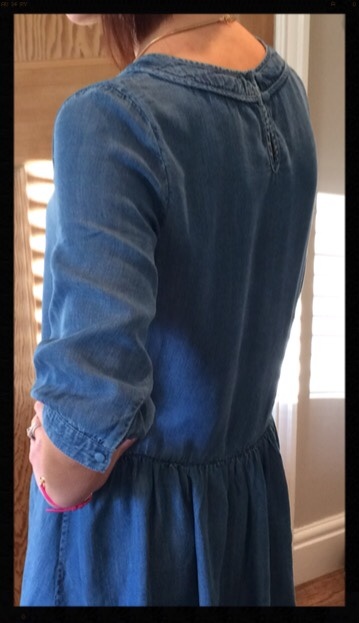 As for the denim dress I ordered my normal size as it's quite a loose styled fit. It really is going to be perfect for throwing on & layering with some statement jewellery for a boho kind of feel. Ooh yes that's a gorgeous colour for Spring Sian. Let me know how you get on with the dress. Yes grey is a perfect neutral isn't it - I don't know how I managed without one for so long!! Thanks Lynne & yes I'm incredibly lucky. Each piece is just gorgeous & I know I'm going to be getting a lot of wear out of them all for seasons to come as they're great wardrobe classics. You can never have enough stripes can you Sarah ;-) I really love that the bag is big enough to get everything in that I need but not too big that I end up carrying to much junk around with me!! I like your nice casual style!